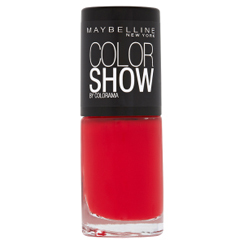 This Color Show Nail Lacquer from Maybelline New York is created with an innovative chip resistant formula that works to keep your colour on for longer. Available in a range of show stopping hues, this nail lacquer features an easy flow brush for precise application and is completely Formaldehyde, DBP and Toluene free. The product claims to be a new gel based formula, with colour popping pigments that gives you bold, crisp, chip resistant colour. But do all these claims really hold any truth? Well I have to be honest, i am simply in love with this shade. I’m such a sucker for red nail polish. Even though I really don’t wear it that often, it will always be a stunning classic shade for me. 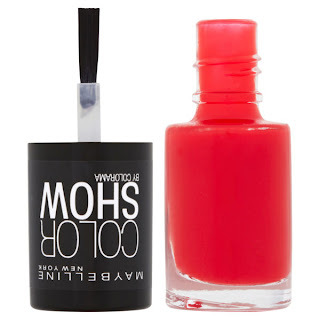 This red is a such a bright and vibrant reds, and it’s an excellent formula. Not too thick, and it dries quicker then many other nail polishes i tried recently. The high shine finish is amazing too. you can see my swatches and nail art HERE its without a finishing top coat, which I think is pretty good going. It only took one coat for a pretty much entirely opaque look but with two your nails stand out so much. I can classify it as the best red paint i have ever used. Have you picked up any of these polishes? What did you think? Which color do you own ? will you buy it again ? I think I’ll have to search out some reviews to see which shades have the thicker, nicer formula before nabbing them all!